Scorpio's symbols go a long way in explaining this complex and magnetic zodiac sign. Scorpio is the only astrological sign that has not one, but three symbol associations: the scorpion, the phoneix, and the snake. The Scorpio symbol that is most commonly identified with this sign is, in fact, the Scorpion itself. It's difficult to tease out what came first; are people inherently afraid of scorpions and that's why Scorpios are feared? Or, do Scorpio's share some general traits that others found reflective in the scorpion? No matter the order, the scorpion is primarily associated with Scorpio. Why is that? First, both are known to have a deadly sting, but both only do so when they feel deeply threatened. For a scorpion, this use of force will cost them their life, and for many Scorpio's, using their "sting" is also quite heartbreaking. Scorpio's truly don't want to hurt anyone, but if backed into a corner, they will. Second, chemicals found in the cuticles of scorpions allow them to "glow" when exposed to ultraviolet light. Interestingly, the sign of Scorpio has often been associated with magical properties. Lastly, scorpions are nocturnal creatures that shun the daylight hours. In general, Scorpio's tend to love the night. Some even report having trouble sleeping, or not feeling tired at all during traditional sleeping hours. The snake has a long and complicated history with humankind. Feared and sometimes revered, the snake has long been depicted, especially in religious works of art, as the physical manifestation of the Devil. Scary stuff indeed! However, when it comes to the Scorpio symbol, the snake takes on the more suggestive, sexual nature of the reptile. The snake is representative here as sexual strength, something that is often associated with Scorpio. Along with this sexual prowess, we also see the theme of transformation (the shedding of the snake's skin). True to its ruler Pluto, Scorpio often transforms everything and every situation they touch. This is a wonderful gift because Scorpio has the capacity to transform undesirable situations into positive ones, and they can also transform their lives whenever they choose to. This is a very important concept because again, borrowing form Pluto and its incredibly long transits through the signs, these changes are long-lasting. Do Scorpios inherently seek danger? The mythical Phoenix is said to rise from the ashes of complete destruction as a symbol of mankind's innate goodness and ability to triumph over evil. This symbol of determination, strength and the ability to rise above the very depths of darkness perfectly encapsulates the Scorpio personality; many a Scorpio shares this ability. Out of all twelve zodiac signs, Scorpio (along with Aries) is the most determined to never give in to failure. Additionally, like the Phoenix, Scorpio has always been associated with deep, intuitive and instinctual wisdom as well as with supernatural powers. In depicting Scorpio, some astrologer's use a large capital "PL" that is encapsulated into one symbol. This represents Pluto's discoverer, Percival Lowell. The second symbol that is used is a cross with an upturned crescent above it, with a circle floating within the cup-shaped crescent. In astrology, crosses always mean "matter", while the crescent is read as "emotion" or the "soul". The circle here represents "spirit". The symbolic meaning for Scorpio is that the soul and spirit will always triumph over matter. 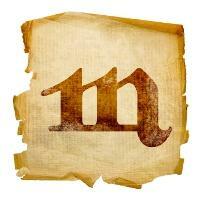 The glyph of Scorpio is an M with the final slash pointing upward with an arrow. The arrow can be seen as the tail of the scorpion poised and ready to strike, or as phallic image, since Scorpio rules the sexual organs. All of Scorpio's symbols tell us that beneath the icy exterior of this zodiac sign beats the heart of a champion that is willing, ready and able to go up against the toughest of odds. Out of destruction and chaos, Scorpio, like the Phoenix, rises from among the ashes to soar triumphantly through the air. The lesson to learn from Scorpio's symbols is to never count a Scorpio out. No matter the circumstances, you can bet on Scorpio pulling through.